Hannah Genders reports on the progress of a very special garden. I have noticed when writing these articles that I have a habit of adding, “I will let you know more as this exciting project develops” at the end, or words to that effect – and more often than not I end up not letting you know how it’s progressing. So this month I have resolved to bring you up to date on the exciting and moving project I wrote about in May’s edition of The Village last year. The project, if you remember, was to design a garden for Edward’s Trust, a wonderful local charity which offers counselling to families who are going through the traumatic experience of childhood illness and loss. The garden will be built at the new National Memorial Arboretum in Staffordshire and will be a permanent feature for families to visit throughout the year. The brief from Edward’s Trust was a challenging one: they wanted a memorial garden to celebrate 20 years of their work. The garden needed to be child-friendly and low maintenance; it also needed to contain all the names of the children the Trust has known and whose families it has worked with over the past 20 years, and to have room to add names in the future. It’s not an easy subject to grapple with, but after getting to know these lovely people and their ambitions, I was keen to try to help. I wanted this garden to appeal to children as well as adults and not be too austere – a large proportion of the work carried out by Edward’s Trust is directly with children, offering help to siblings of children who have died. I was also keen for the garden to be an interactive space where visitors could feel part of the garden and contribute in some way, and, last but by no means least, it needed to be beautiful. The ideas really started to come together over the summer, particularly one day while I was riding my bike and thinking about these challenges. The focal point of the garden is a ‘Tree of Hope’ which will be carved from oak. It will be bare when the garden is constructed but will ‘grow’ leaves as children’s names are added in the future. These leaves will be made from copper and engraved with the names the families wish to remember. On the floor under the tree, bronze leaves in a swirling pattern will contain the names of all the children Edward’s Trust has worked with and wants to remember. The tree is surrounded by a curved metal trellis to make this a secluded, intimate space, with seating facing into the tree feature. Scented climbers of honeysuckle and old fashioned roses will be planted up the trellis to add perfume to the garden. 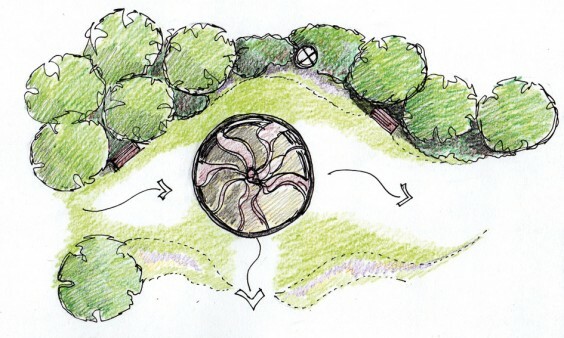 Moving out from the central space, the garden will be surrounded by a small woodland and seating within, to allow visitors private time away from the main garden. Woodland bulbs of bluebells and snowdrops will be planted in drifts, with wood anemones and fox gloves adding colour and interest. Native trees will be planted in this area, plus a cank thorn (Crataegus laevigata) from the nearby Cannock Chase. The pitch we have been offered at the National Memorial Arboretum looks out over the river and the orientation of the garden is to face this view – it’s a lovely spot. So, the design work is all done. Edward’s Trust was thrilled with the ideas, which then had to go forward to the National Memorial Arboretum’s board of trustees. It managed to get through this with very few changes being made, and is set to be built later this year. The main challenge now is fundraising, and various schemes are underway to try and get the cash together. I am especially keen to raise the money needed separately, so that it doesn’t impinge on the charity’s main work.